After a hard day at work or at the start of a relaxing weekend or vacation, there are few greater pleasure in life than a long, hot bath. 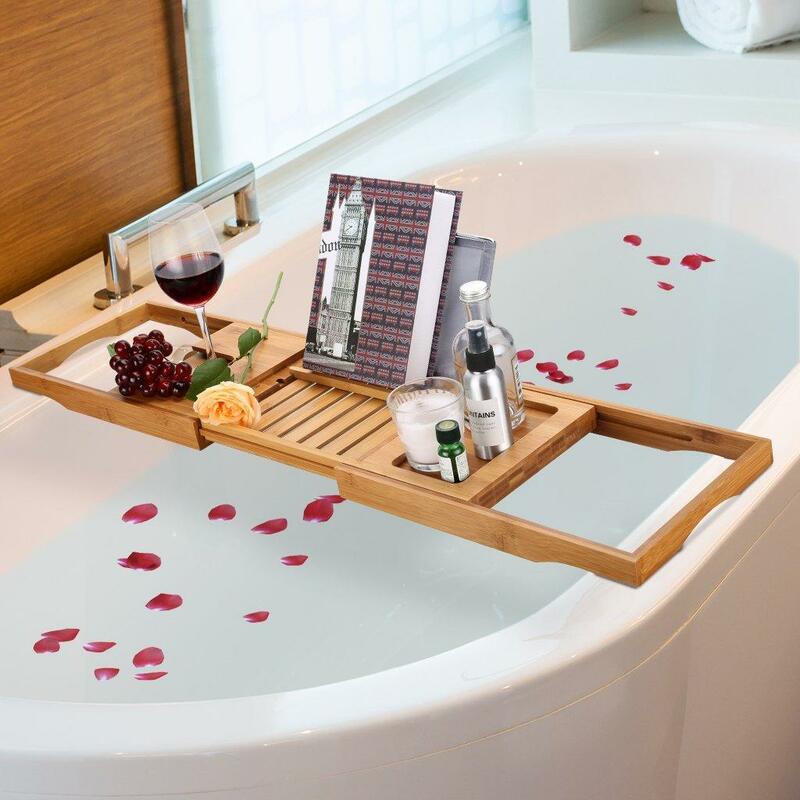 To really enjoy an extended soak, you need a few accessories, and that's where bathtub trays and caddies are a godsend. 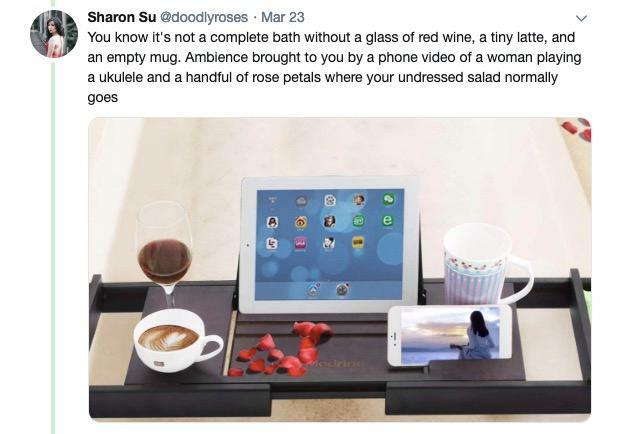 With one of these babies, you can keep your book, tablet, and glass of wine close at hand. 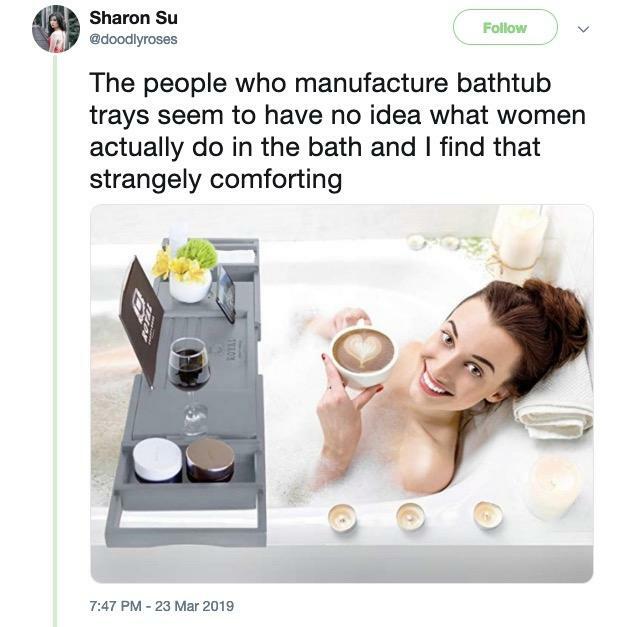 However, as Twitter user Sharon Su (@doodlyroses) points out, the manufacturers of these ingenious devices have some pretty weird ideas about women's bathtime. 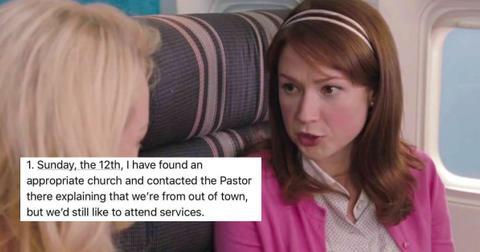 Scroll through her hilarious insights along with some of our own baffling finds. 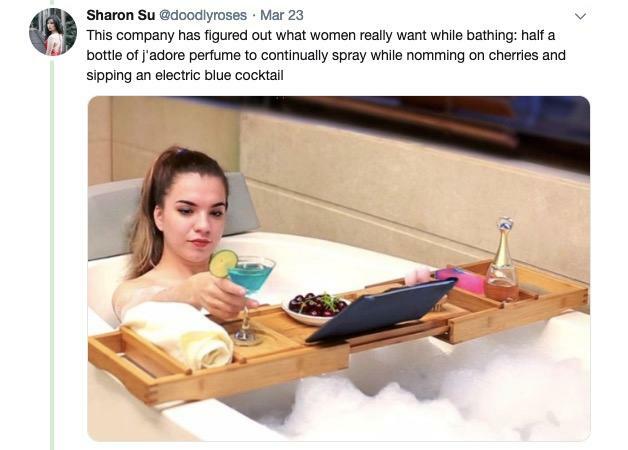 A major theme throughout these images is that women are apparently enjoying a lot of beverages at once while they soak in the bubbles. This Emmy Rossum lookalike appears to be enjoying a latte with some impressive foam art, but she's got a full glass of red on deck. 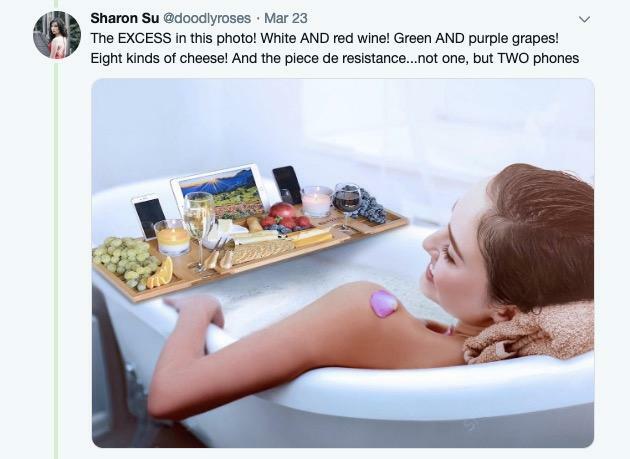 It's also remarkable that she took the time to bring a tasteful flower arrangement into the bath with her. Another dominant theme in these photos is the judicious scattering of rose petals, which I think 9 out of 10 plumbers would not recommend, btw. Anyway, if this salad is your idea of a decadent tub treat, well I'm really sorry about your life. 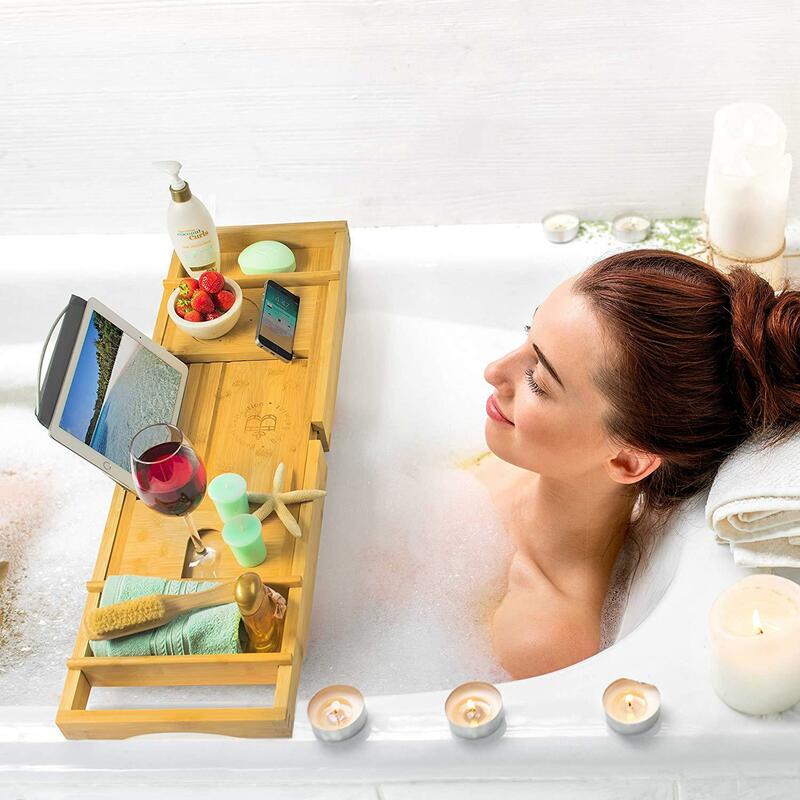 This bath lover wants to make extra sure she doesn't get thirsty with three beverage choices close at hand. I'm guessing those rose petals are for a snack later. 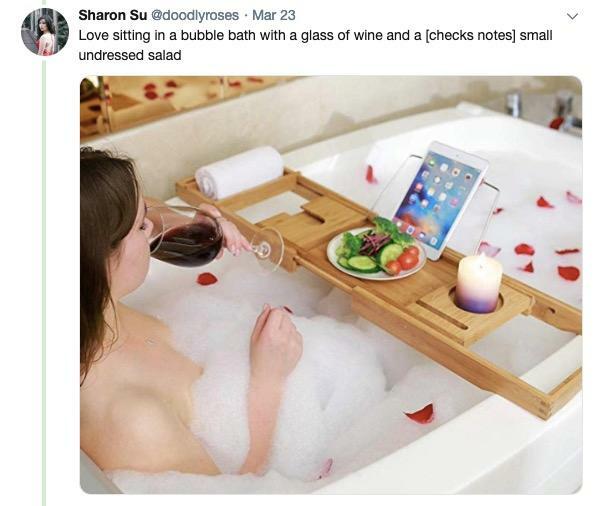 I have so many questions about the woman having this bath. She truly seems to contain multitudes. 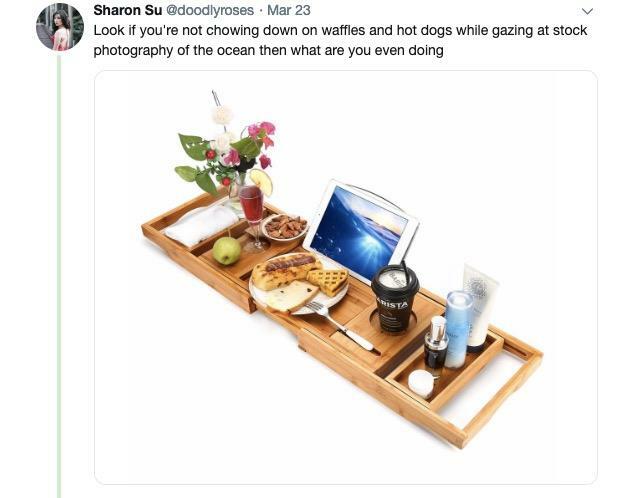 She clearly has a serious, intellectual side, what with her enjoying an environmentalism story in the latest National Geographic, but she's not so buttoned up she can't enjoy a weird YouTube video of two girls one sandwich. The dry cereal and Windex martini add some additional layers. But really, is the bathtub the best place for a manicure? The blue martini has clearly missed me. Is this the new cosmopolitan? The more I see the suggested uses for this caddy, the more I become unsure of how necessary this bath accessory truly is. Like I'm pretty sure there's never been a time I was in the tub and thought, "damn, there's no place to put my bowl of bing cherries! Now here's a woman who knows how to live it up. Full charcuterie board and fruit plate, two phones, two glasses of wine, and a truly breathtaking screensaver of a mountain. Also, is it just me, or is she gazing lovingly at that rose petal on her shoulder? 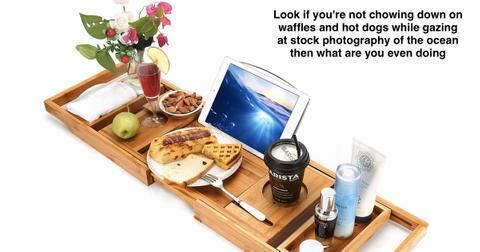 Breakfast in bed is for losers. Give me breakfast in bath, complete with a to-go coffee from my favorite cafe, Barista. Don't forget the lotion, so your skin doesn't get too dry... in the bath. 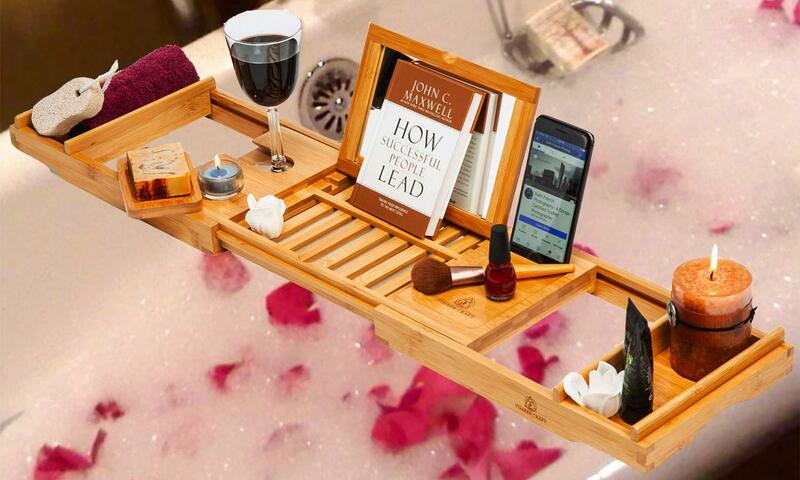 This bath has everything you could need: A motivational self-help book, wine, a makeup brush (no makeup though! 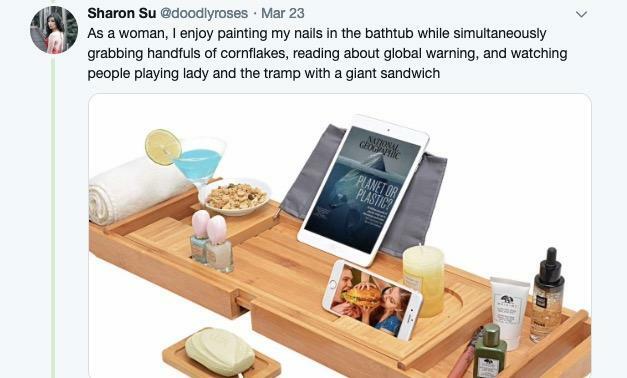 ), nail polish, and the Facebook fan page for (I'm guessing) this photographer, who's clearly super good at staging realistic bath tableaux. If you're stressing about who's going to finish your London scrapbook while you get pruney in the tub, RELAX. You can take it with you, and still have room for your single peach rose and, of course, a nice big glass of milk. Never again will you have to ask yourself, "How am I going to enjoy my starfish in this bath? Look, it fits! This stock photography really took a turn to the dark and possibly disturbing. It appears the murder victim was dressed in her bathing blouse while enjoying a nice pinecone facial and answering some emails about the latest quarterly report when the intruder entered the room. 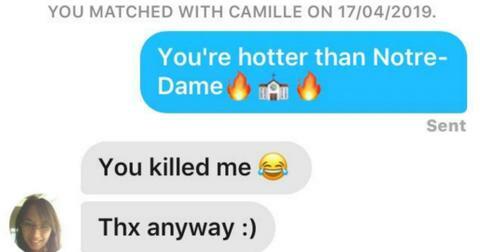 Such a tragedy. 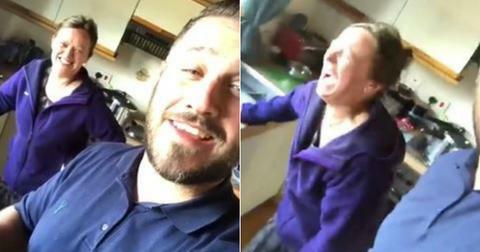 She didn't even get to finish her wine!